‘While sailing RS Boats we all have made friends, met partners and introduced families to it all. Sailing in one of our classes comes with communities with vibrant lifestyles of competition, camaraderie and sailing excitement. Now it is going to be even more fun. 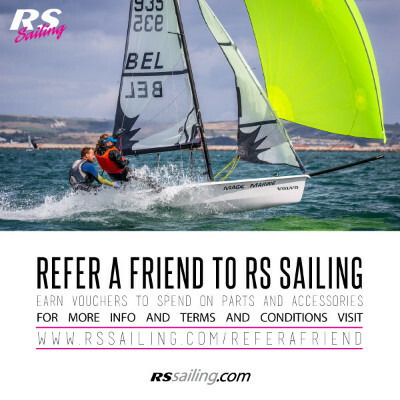 You can benefit from inviting your friends to join owning an RS boat and earn up to EUR 350 on credit for spare parts and accessories for your boat. If you have any more questions, please don’t hesitate to contact me! Thanks! All incl. VAT. Excl. shipping charges. Referrer needs only to disclose surname and sailboat type of buyer, no other personal data is required. The voucher code may be issued in either GBP sterling, Euro or US Dollars and is not transferable.